Home Film Why the Hell Can’t Hollywood Make a Decent Music Festival Movie? Scripts for films set at music festivals must land on Hollywood executives’ desks on a pretty regular basis. Maybe the film involves a heist. Maybe it’s about a young musician getting his big break. Or maybe it’s a quasi-comedy ensemble piece about coming of age or relationships or something. There are plenty of worthwhile documentaries about music festivals—Woodstock and Gimme Shelter come to mind, of course—but Hollywood has no clue what to do with contemporary music festival culture in its movies. Why is that? Why is there no great Coachella movie? But also—do we want one? Music festivals have always been part our shared pop-cultural experience, but they’ve become particularly popular excursions among 18- to 34-year-olds over the past couple decades. From Burning Man to Panorama to EDC, fests have also become increasingly bougie, representing a sort of arms race to see which can incorporate the most brand synergy and pretentious glamping amenities. As music festivals have become overwhelmingly corporatized and have honed their ability to extract cash from young and old folks alike, the festival-going experience has become homogenous. And, usually, expensive as hell. Coachella trips can easily spiral into the thousands of dollars, which means the experience is for a very specific audience: rich (or aspirationally rich) people. That could explain some of the hollowness of the experience, like in Netflix’s 2016 dud XOXO, which was sold as some generation-defining comedy that had its pulse on EDM culture but, in fact, lacked a pulse at all. Modern film history has plenty of similarly forgettable examples. The first one I personally recall is Wayne’s World 2, a hastily spewed out sequel about Wayne being visited in a dream by Jim Morrison, who tells him to start a music festival. WW2, which came out in 1993, perhaps unintentionally predicted the cynical Woodstock reboots in 1994 and 1999, two festivals that have aged poorly and will be remembered as the beginning of this new era of mostly disappointing music festivals. Maybe fests are only enjoyable when they’re experienced as first-person activities. Or maybe the people writing these stories have superficial relationships to music and music culture, which means they only think their perspective on music or youth culture is valid or interesting. 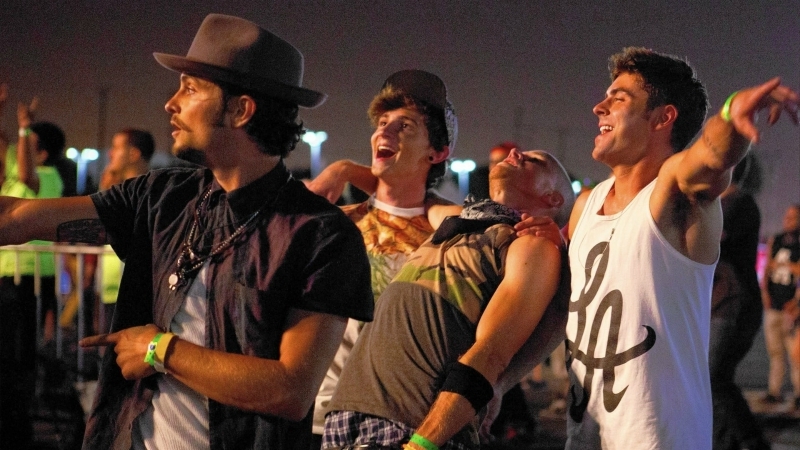 I suspect that’s the case with 2015’s Zac Efron EDM vehicle—and notorious flop—We Are Your Friends, which feels like it was written from a place so outside the culture that the distance is apparent in every moment. It’s about a DJ who rises to prominence and eventually plays a big fictional festival called SUMMERFEST. In order to shoot that climax, the makers staged an actual street party near the American Apparel building in downtown L.A., which seems like it was probably as boring to attend as it was to watch in the final product. Even genre movies don’t know what to do with music festivals. Project Almanac, a 2015 confused time-travel flick that for some reasons finds the characters in a Lollapalooza from their past, had a lot of issues, least of which was trying to say something about youth culture and shoe-horning a music festival as a dramatic set piece. The results, again, are mostly forgettable, and the festival stuff just seems like an arbitrary add-on, like some vestigial producer note from seven drafts ago that somehow stayed in. To be fair, this isn’t just a music or music festival-specific issue, as Hollywood screenwriters aren’t necessarily known for embedding themselves inside of specific cultures the way journalists do. But it’s worth calling out. Even if producers often hire consultants down the line to try to lace these things with some sort of authenticity, in most cases, the train’s already left the station. For now, beware any American film where a music festival plays a substantial role. It’s a screenwriting canary in the coal mine. Instead, save your money for a Coachella layaway plan. Or, better yet, if you really love music, support your local musicians instead. Next articleWhat Comedy Store Owner Mitzi Shore Meant to Yakov Smirnoff, Chris D’Elia, and Comedy in L.A.